North China’s Inner Mongolia autonomous region is about 2,400 kilometers in straight line distance from west to east, bordering Mongolia and Russia. It is also adjacent to eight provinces spanning China’s northeastern, northern and northwestern parts, including Heilongjiang, Jilin, Liaoning and Shanxi provinces. With such geological location, along the region’s border line of 4,200 km, total of 19 national-level border ports have been established – the most in the country. Border trade in Inner Mongolia can be divided into three phases. The first phase is from 1983 to 1987. During the period, border trade is monopolized by only one State-owned firm with export/import value worth $1.1 million in 1983 and $46.92 million in 1987, ranking first among other border regions and provinces. The second phase is from 1988 to 1993 when border trade businesses had a leapfrog development with the participation of more border trade and export firms. During the period, the export/import value also increased from $116.88 million to $772.03 million. The last phase is from 1993 to present. Experiencing the restoration period between the end of 1993 and 1995, border trade in the region was in bloom. The cooperation mode with Mongolia and Russia was also developed from single barter trade to a comprehensive pattern, involving liquidation trade and cooperation in economy and technology. Inner Mongolia boasts the largest number of border ports in China. These ports, bordering Mongolia or Russia, have helped China’s opening-up to surrounding countries and more European countries. In 2018, the region’s foreign trade hit a record high, yielding 103.4 billion yuan ($15.2 billion). The import and export values were 65.6 billion yuan and 37.9 billion yuan, an increase of 7.5 percent and 14.4 percent respectively. Manzhouli Port is the largest border land port in China. 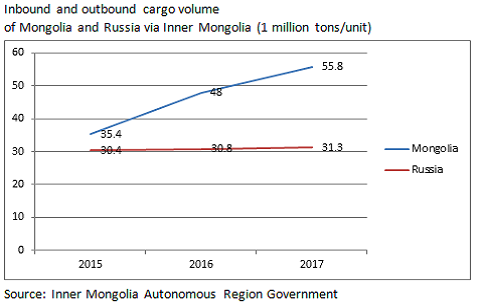 More than 65 percent of cargo in Sino-Russia trade is transported through the port. 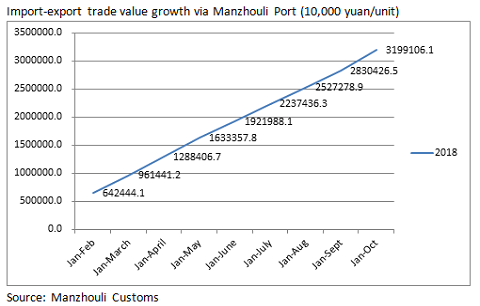 In the Jan-Nov 2018 period, the import-export value was 35.8 billion yuan, a year-on-year increase of 5.1 percent. The import and export values were 22.2 billion yuan and 13.6 billion yuan, a decrease of 1.1 percent and an increase of 17.1 percent year-on-year respectively. Ereenhot is a county-level border city in Xiliin Gol, North China’s Inner Mongolia autonomous region. With a border line of 72.3 kilometers, it borders Mongolia and is only 4.5 km from Zamen Ude in Mongolia. 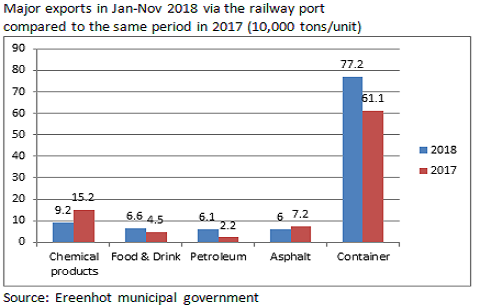 From January to November 2018, cargo transported through the port totaled 15.3 million tons, an increase of 13.6 percent year-on-year. About 2.2 million people entered or left through the port, an increase of 8.1 percent year-on-year. Mongolia and Russia are two largest trading partners of Inner Mongolia. 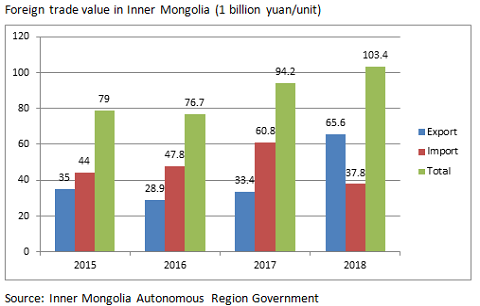 In the Jan-Nov 2018 period, a total of 50.5 million tons of goods were imported from or exported to Mongolia via ports in Inner Mongolia, a year-on-year increase of 9.2 percent. The import and export volumes were 46.6 million tons and 3.9 million tons respectively. The same figure for Russia was 29 million tons, up by 2.5 percent year-on-year. The import and export volumes were 14.7 million tons and 3.7 million tons respectively.